… which is funny because before I moved to the U.S., I had no idea Cinco de Mayo was even a thing! Brazilians are definitely missing out on this holiday and all the Mexican food that comes with it. Not that I need an excuse to eat Mexican food! Especially not this Easy Chicken Quesadilla that I have to say was devoured in a matter of seconds. 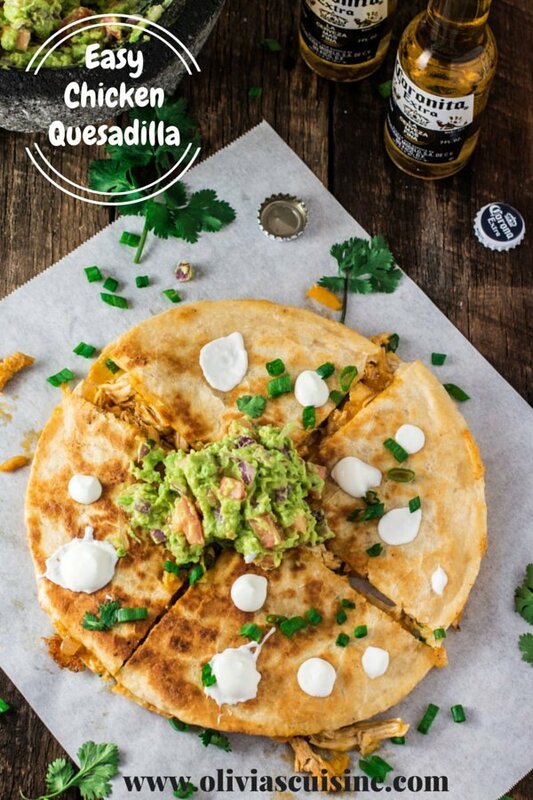 I mean how could we not adore this quesadilla? First, it has cheese! Second, it’s so easy to make and is a great option for those busy weeknights. And third, it’s loaded with flavors with chicken, peppers, onions, garlic and roasted Pasilla chile sauce. Then it is grilled to perfection until the cheese melts and your whole apartment smells like Mexican Heaven! Drooling much? I am! But, back to Cinco de Mayo. If you’re not in North America, chances are you probably never heard of this holiday. Mostly because it is only celebrate in the United States and in Mexico, where it is called El Día de la Batalla de Puebla (The Day of the Battle of Puebla). The date is celebrated to commemorate the unlikely victory of the Mexican army over the French forces at the Battle of Puebla, on May 5, 1862. Yay Mexican army!!! However, many people – including me, before I took time to research it – mistaken the holiday as Mexico’s Independence Day which is actually celebrated on September 16. Here in the US, this holiday is more about Mexican Americans celebrating this day as a source of pride and honor to their ethnicity. In NYC you will see Mexican flags everywhere and lots of bars and restaurants decorate and stock up with margaritas and lots of Mexican food for the fiesta! This time I won’t be able to join my Mexican friends for the party. As much as I would love to go out and have one too many Watermelon Margaritas, I broke 2 toes on Thursday. Ouch ouch ouch! You know, just being the clumsy me, I hit the corner of the couch and got two purple broken toes to add to the extensive list of ailments of 2015! So no going out and celebrating Cinco de Mayo for me. Because I risk getting drunk and breaking the other 8 toes. Bummer! 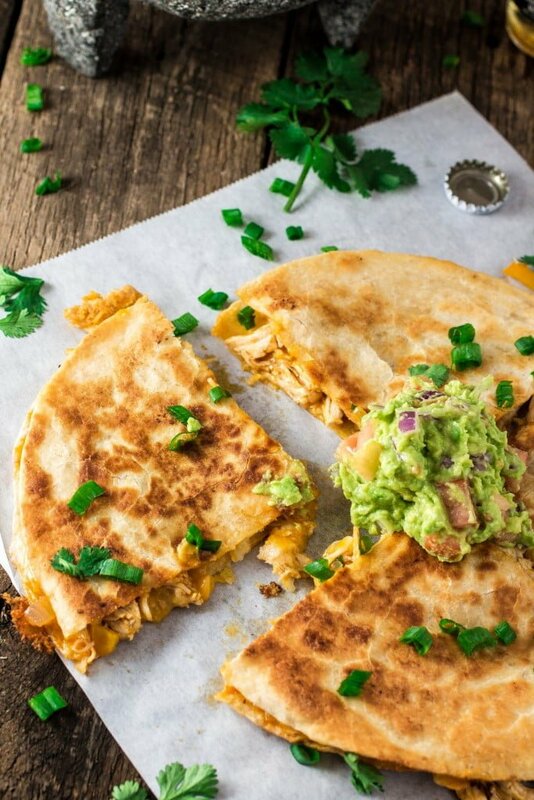 I must confess the only part that annoys me when making chicken quesadilla is having to wait to the chicken to cook, then waiting for it to cool and finally shredding it. It can be soooo boring for people that lack the patience, like me! For a creamier quesadilla, I like to add 2 tablespoons of butter to my chicken mixture. I also fry the quesadillas in 1/2 tablespoon of butter so they get nice and golden brown on the outside. Feel free to omit the butter for the mixture and use olive oil (or nothing) to fry the quesadillas for a healthier version! Don’t forget the guacamole! Sour cream and fresh salsa are also great quesadilla friends. Now, all that’s left to do is open a Corona or make a margarita and your Cinco de Mayo fiesta is done! Start by cutting the chicken breasts into smaller pieces (3 pieces per breast) and marinating it with the lime juice and some salt and pepper. Cover and refrigerate for at least 30 minutes. Add some olive oil to the pressure cooker and sear the chicken on both sides over medium high heat. Add 8 cups of water, season with some salt, close the pressure cooker and once the pressure begins, lower the heat to medium low. Cook for 15 minutes or until the chicken is tender. On a large pot, over medium high heat, heat some olive oil and sear the chicken on all sides. Add 8 cups of water, season with salt and, once it boils, lower the heat to medium low and let the chicken simmer for 20-25 minutes or until it is tender. Remove chicken from pot and, once is cool, shred it with a fork. In a large saute pan, heat 2 tablespoons of olive oil and sauté the onion and garlic for a few minutes. Add the peppers and cook until tender. Add the shredded chicken, the roasted Pasilla chile sauce and the cilantro, if using. Stir everything until combined. Reduce heat to low and let it simmer for 10 minutes.Taste for seasoning and add some more salt if necessary. If desired, add 2 tablespoons of butter to the mixture for creaminess. Stir to combine. Reserve. Mix both kinds of cheese in a bowl and reserve. Heat a large skillet over medium heat until hot, about 3 minutes. Add 1/2 a tablespoon of butter and let it melt. Place a tortilla in the pan and sprinkle with 1/4 of the cheese and 1/4 of the chicken. Top with a second tortilla and cook until the bottom tortilla is golden brown and the cheese is starting to melt. 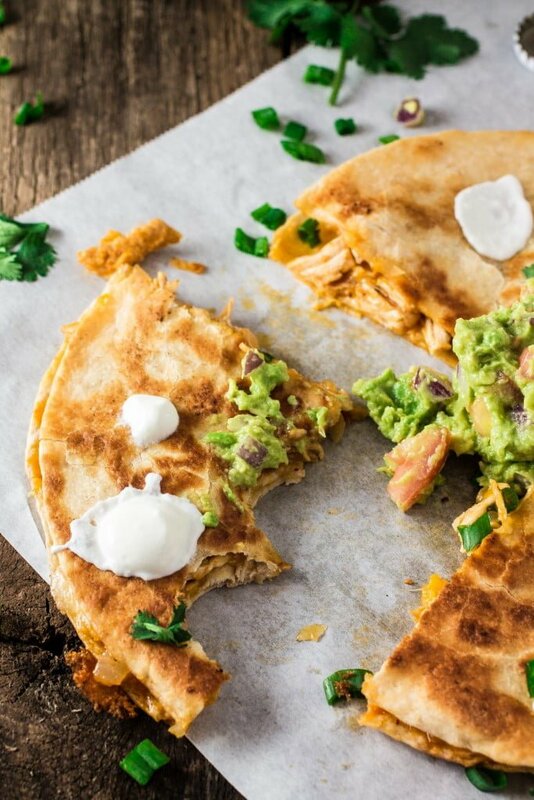 Using a spatula and your hands, carefully flip the quesadilla over and cook until the second tortilla is crisp and golden brown and all the cheese is melted. 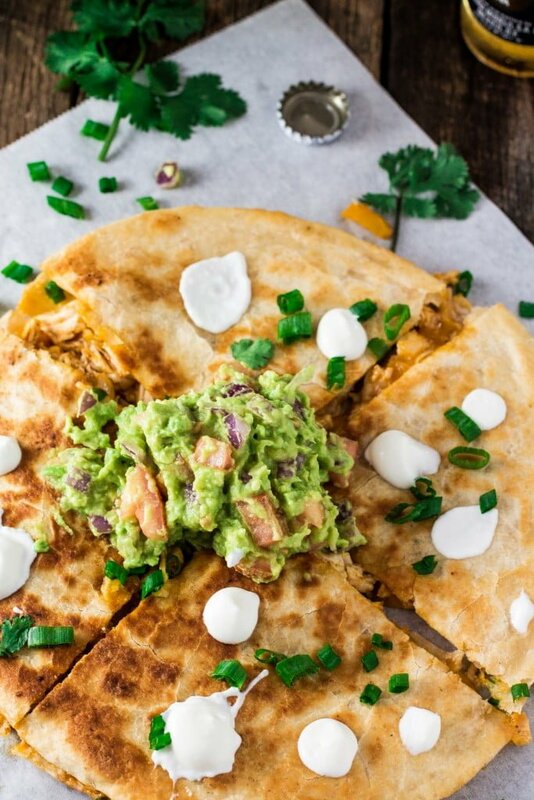 Slide the quesadilla to a cutting board and cut into wedges. Repeat all the steps above with the next 3 quesadillas. Serve with guacamole, sour cream and/or fresh salsa. Mexican cuisine is the best! <3 Thanks, dear!! 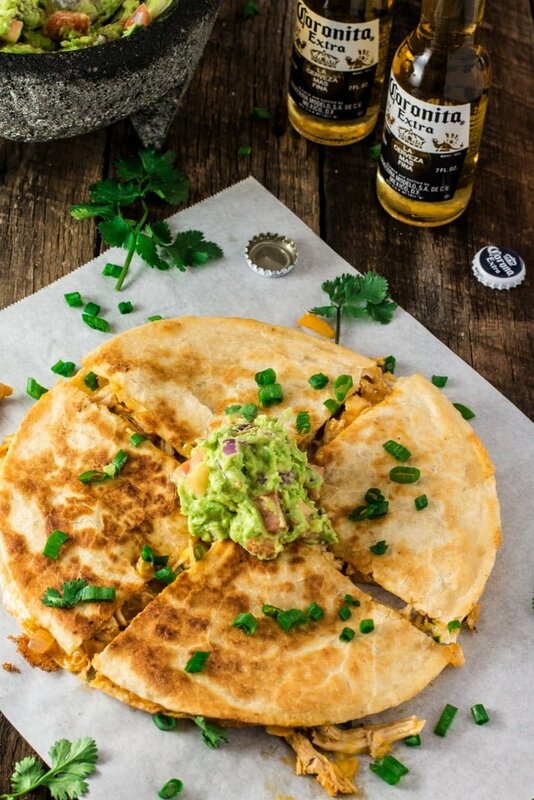 These quesadillas look awesome! Making something Mexican for lunch today :) So sorry to hear what happened, hoping you are not in a lot of pain ! 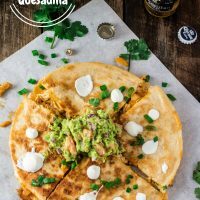 Delicious quesadillas, I wish I could grab a bite right now LOL! Oh dear so sorry to hear you broke your two toes and hope you feel better soon. So perfect for Saturday night snack! And with a beer…hmmmm, yummy indeed!!!! Perfect for Saturday night snack! And with a beer…hmmmm, yummy indeed!!! !